Yes. We said that. 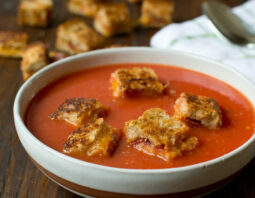 And we’ll say it again: Grilled Cheese and Bacon CROUTONS. A rainy day. A big glass of milk. A bowl of warm tomato soup. A grilled cheese sandwich. Takes you back, right? Me too. Here I’ve upgraded things a bit. Made it a little more fun and maybe kinda fancy. It’s all about those grilled cheese croutons. You might notice that there’s a cornstarch and water mixture in this recipe. Why use cornstarch and not flour as the thickener? I wanted to replicate that slightly gelatinous quality of condensed cream of tomato soup. A broth thickened with cornstarch has more of that quality. If this soup had flour instead, the texture would be more like the gravy in a stew. Also good, but not like the soup I remember from those rainy days. Put a large pot or Dutch oven over high heat. Add the chicken broth, diced tomatoes, sugar, salt, pepper, paprika and cayenne. Cover. Peel and chop the garlic. Add it to the pot. Stir and cover. Stir occasionally until it reaches a simmer. Reduce heat to low. Meanwhile, put a large skillet over medium heat. Butter one side of each piece of bread. Put the bread slices butter-side-down in a single layer in the skillet. Top each with 1/4 cup of cheese. Break the bacon slices in half and arrange it in a single layer on one of the pieces of bread. Cover the skillet and cook until the bread is toasted and the cheese is melted. Keep your eye on the bottom of the bread to make sure it doesn't burn. You may have to reduce the heat if it's toasting too quickly. When the bread is toasted underneath and the cheese is melted remove from the skillet. Stack the two breads into a sandwich with cheese and bacon in the middle. Cut the sandwich into 5 strips and then cut each strip into 5 squares. Once the soup has reached a simmer, combine the cornstarch and water. Use an immersion blender to puree the soup to the desired texture. Stir in the cornstarch and water mixture. Return soup to a simmer. Remove from heat and stir in the cream. Ladle into bowls and top each serving with 6-7 grilled cheese croutons. 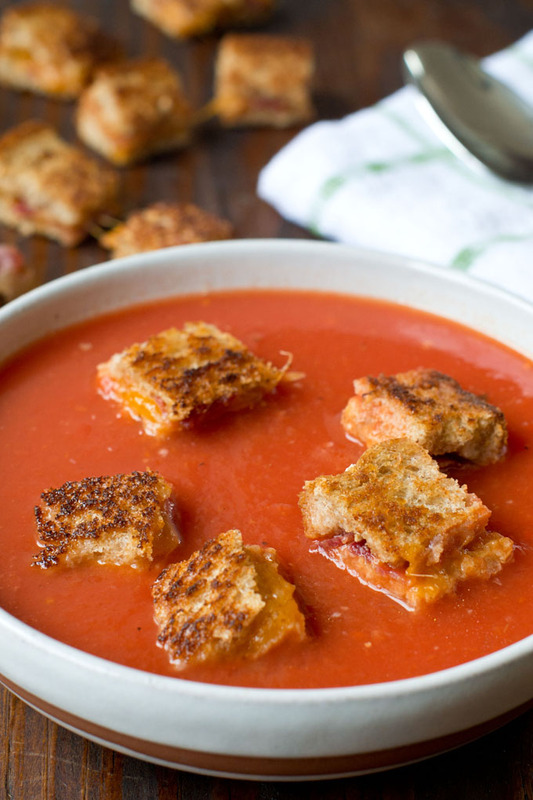 Homemade Tomato Soup with Grilled Cheese and Bacon CROUTONS. Heck yeah! Our quick soups ebook has everything you need to make delicious soups fast. How To's, Tips and recipes galore. Homemade Chicken Noodle Soup in 15 minutes. Lickety split! Who knew homemade soup could be so quick? You'll be making soup zippety zap once you know about these quick-cooking convenient ingredients. Enough homemade delicious soups for twice a week for a year. Almost. Haha. From a quick and easy roux technique to the quickest meatballs for simmering, you'll be making soup in a flash. We did a whole series on Quick Soups with how to's, tips, recipes and more.